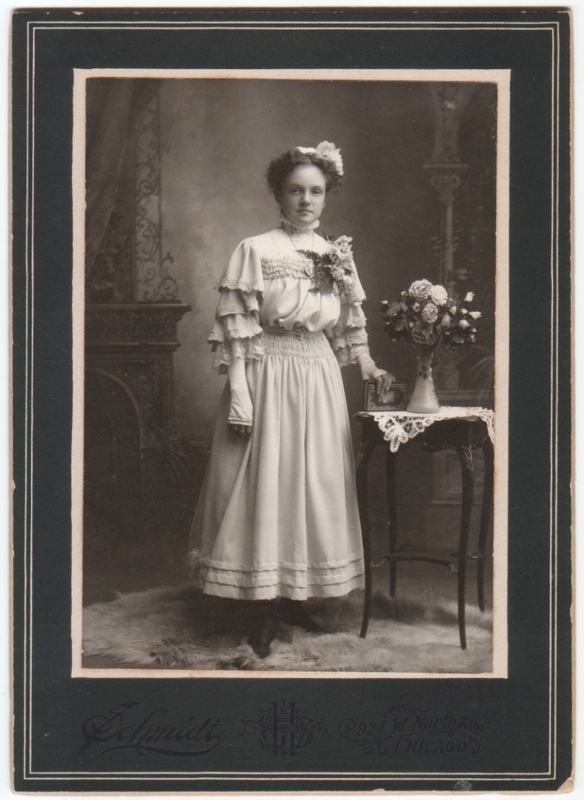 Cabinet card measuring approx. 5.25 x 7.25 inches. Photographer is Schmidt of Chicago, Illinois. (I believe the full name is William H. Schmidt.) Otherwise undated and unidentified. A few years ago I was involved in a theatrical production of the classic Kaufman & Hart play The Man Who Came to Dinner. The play involves a long-term house guest who drives the household crazy by being extremely rude and impossibly demanding. But one subplot is that he is mysteriously charmed by the crazy old aunt living in the attic. At one point she delights him by presenting him with an old photo of herself in her youth. I knew the audience wouldn’t really be able to see it, but I knew this actress would want something accurate, so I gave her a copy of this photo. She was delighted, and every time I look at this photo I remember the good times I had with that show.